Accounts Connected To The Republican Governors Association And The Democratic Governors Association Started Airing Broadcast Ads In August. 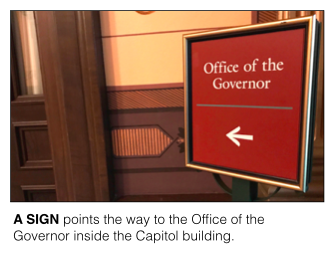 LANSING (SEPT. 4, 2018) — The general election race for Michigan governor is less than one month old. But already, an estimated $1.6 million in broadcast TV ads have aired since the primary. The spending total, which is based on an analysis of Kantar Media/CMAG ad-tracking data through Aug. 27, is being driven by organizations connected to two national groups: the Democratic Governors Association (DGA), which works to elect Democratic gubernatorial candidates; and the Republican Governors Association, which works to elect Republican gubernatorial candidates. Both associations are based in Washington, D.C., and invest in gubernatorial races across the country. A Stronger Michigan, a political organization connected to the DGA, has already aired about $678,000 in broadcast ads promoting the Democratic candidate for governor, Gretchen Whitmer. She is the former Senate minority leader from East Lansing. A Stronger Michigan appears to be a 527 account. Its ads fall outside of Michigan’s campaign finance disclosure requirements because they don’t expressly support or oppose a candidate for governor. The organization does file disclosures for the public to view through the Internal Revenue Service. As of the end of June, it hadn’t disclosed raising or spending any money. Its next disclosure will be due in October. As for the groups boosting Republican candidate Bill Schuette, the state’s attorney general from Midland, there is another group named A Stronger Michigan and a nonprofit called State Solutions. 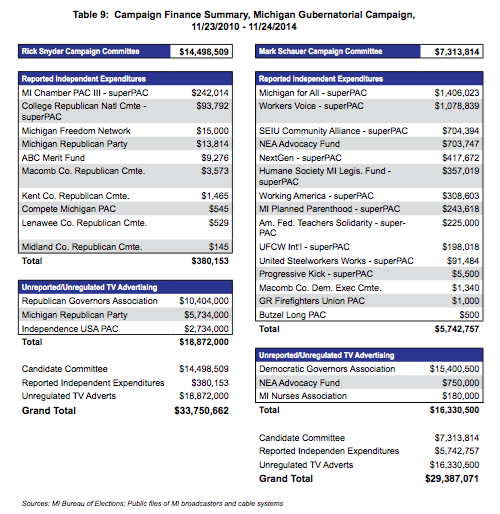 In this case, A Stronger Michigan appears to be a super PAC that formed in Michigan in July. It's aired about $347,000 in ads, according to an analysis of Kantar Media/CMAG ad-tracking data. The super PAC shares an address with the RGA and changed its name to RGA Michigan 2018 in late August, according to a filing with the Michigan Secretary of State. The super PAC will file a report on its donors in October. State Solutions is a social welfare nonprofit that’s also connected to the RGA. The nonprofit has aired about $622,000 in ads so far, according to the analysis. In its 2016 federal tax filing, the organization said it was “related” to the RGA. Because it’s a nonprofit, State Solutions doesn’t have to disclose where its money comes from. The GOP-backed A Stronger Michigan has been running negative ads about Whitmer. State Solutions has been running ads touting Schuette’s work. It’s normal for the RGA and DGA to be large spenders in competitive races for governor. In 2014 when Gov. Rick Snyder won a second term against Democrat Mark Schauer, the RGA ran about $10.4 million in TV ads to help Snyder while the DGA ran about $15.4 million in ads to help Schauer. They were the two biggest spenders in the $63-million race. Which Michigan Donors Are Giving To the DGA and RGA? The DGA and the RGA are 527 organizations that disclose their donors on a quarterly basis through the Internal Revenue Service. Both groups raise money from across the country, including from some donors based in Michigan. MCFN examined the top donors to each group from the start of 2017 through the end of June 2018 to see which donors listing Michigan addresses have given the most. Here’s what we found.